396 Marlborough is located on the south side of Marlborough, between Hereford and Massachusetts Avenue, with 394 Marlborough to the east and 398 Marlborough to the west. 396 Marlborough was designed by Cummings and Sears, architects, and built in 1887 by Whidden, Hill & Co., builders, as the home of Sarah (Shaw) Davis, the widow of lawyer Samuel Crafts Davis, Jr. She is shown as the owner on the original building permit application, dated June 21, 1887, and on the final building inspection report dated August 13, 1888. Sarah Davis purchased the land for 396 Marlborough on February 15, 1887, from Benjamin Williams Crowninshield and Walter Channing Cabot. It was part of a parcel with a 498 foot frontage on Marlborough, extending west to Massachusetts Avenue, that they had acquired on January 20, 1880, from John Brooks Fenno and William Storer Eaton. J. Brooks Fenno and William Eaton had purchased the land that same day from Grenville T. W. Braman, Henry D. Hyde, and Henry M. Whitney, trustees of a real estate investment trust that had purchased several parcels of land on March 1, 1872, from the Boston Water Power Company. The land owned by the trust originally had been divided by Parker Street, a 60 foot wide street located on top of the Cross Dam, which ran southwest from Beacon at approximately a 45 degree angle, intersecting the south side of Marlborough at a point about 394 feet west of Hereford. When the street was abandoned as a public thoroughfare in 1879, Grenville Braman and his partners purchased the land underneath from the Boston Water Power Company and combined it with their other property. The houses at 396-398-400-402-404-406 Marlborough were partially built on land that previously had been Parker Street, with the Cross Dam below. 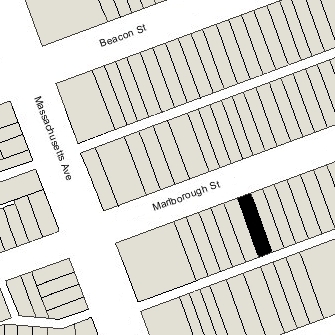 Click here for an index to the deeds for 396 Marlborough, and click here for further information on the land on the south side of Marlborough between Hereford and Massachusetts Avenue. By the 1887-1888 winter season, Sarah Davis had made 396 Marlborough her home. In the early 1880s, she had lived at 49 Winthrop with her widowed father-in-law, Samuel Crafts Davis, Sr.; he died in October of 1882. By the 1889-1890 season, she had been joined at 396 Marlborough by her sister, Adela Shaw. She previously had lived at 165 Beacon. She continued to live with Sarah Davis during the 1895-1896 season, but moved thereafter to The Empire at 333 Commonwealth. Sarah Davis continued to live at 396 Marlborough until her death in April of 1909. Samuel and Sarah Davis had no children, and in her will, she left 396 Marlborough to her brother, Henry Southworth Shaw. He and his wife, Louisa Stuart (Towne) Shaw, lived at 339 Commonwealth until about 1907, when they made Milton their home. On August 31, 1909, 396 Marlborough was purchased from Henry S. Shaw by Dr. William Carter Quinby, a physician. He was unmarried and made 396 Marlborough his home and medical office, joined by Dr.Theodore Jewett Eastman, also a physician. They both previously had lived and maintained their offices at The Graffam at 330 Dartmouth. William Quinby married in January of 1910 to Marguerite Elizabeth Thayer. 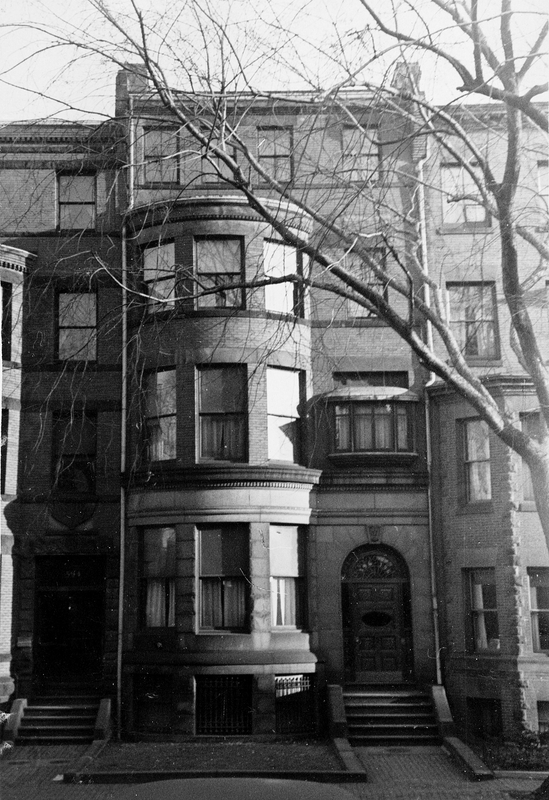 After their marriage they lived at 396 Marlborough during the 1911-1912 winter season, but moved thereafter to an apartment at 407 Marlborough. He moved his offices to Haddon Hall at 282 Berkeley (29 Commonwealth). He continued to own 396 Marlborough and lease it to others. Theodore Eastman continued to live and maintain his offices at 396 Marlborough until during the 1911-1912 season, but moved thereafter to 71 Marlborough. By the 1912-1913 winter season, 396 Marlborough was the home of Dr. Chandler Robbins, Jr., and his wife, Laura Wolcott (Foster) Robbins. He also maintained his medical offices there. They previously had lived (and he had maintained his medical offices) at 386 Commonwealth. Chandler Robbins was a physician specializing in the nose and throat. He was a Harvard classmate of William Quinby. Chandler and Laura Robbins continued to live (and he to maintain his medical office) at 396 Marlborough in 1915. By 1916, they had moved to Weston and he had moved his office to 355 Marlborough. On December 7, 1915, Henry S. Shaw foreclosed on a mortgage given by William Quinby and took possession of the property. On July 17, 1916, 396 Marlborough was acquired from Henry Shaw by Mrs. Susan (Fitzpatrick) Sherry, former wife of Thomas Sherry (Sharey). 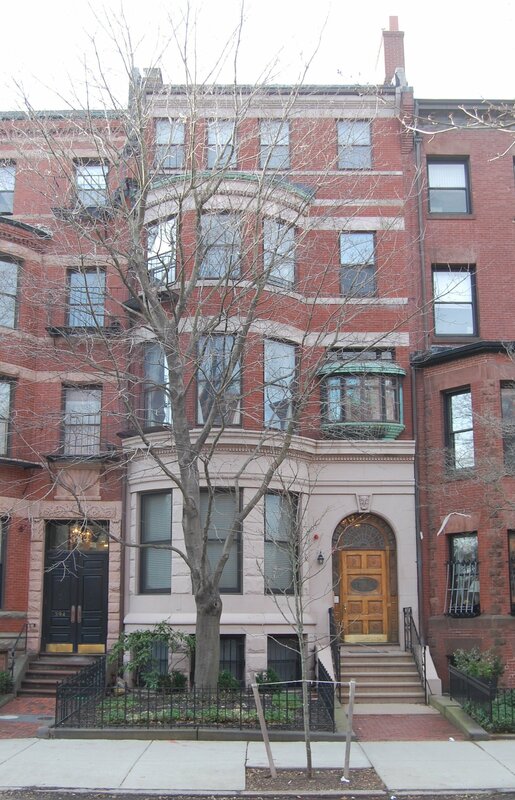 She was associated with a brokerage firm and was frequently named as a purchaser or conveyancer of property in articles on real estate transactions in the Boston Globe between 1911 and the early 1920s. On June 21, 1917, Susan Sherry transferred 396 Marlborough to real estate dealer Louis P. Kaufman (with the deed dated July 17, 1916, the date she purchased it), and on the same day it was acquired from him by Elizabeth Hancock (Page) Hall, the wife of Dr. Gardner Wells Hall. They previously had lived at 475 Beacon. They also maintained a residence in Cataumet. Gardner Hall was a physician and maintained his medical office at 396 Marlborough. He died in April of 1935. Elizabeth Hall continued to live at 396 Marlborough until about 1938. On October 17, 1938, Elizabeth Hall transferred 396 Marlborough to the Massachusetts Hospital Life Insurance Company, which held the first mortgage on the property. The house was shown as vacant in the 1939 and 1940 City Directories. In November of 1939, the Building Department advised Massachusetts Hospital Life that an application had been filed with the Licensing Board to use 396 Marlborough as a lodging house. The letter summarized the egress, change of use, and fire safety requirements to permit the property to be used for that purpose. The Building Department files do not include a permit application implementing these requirements. On April 9, 1940, 396 Marlborough was purchased from Massachusetts Hospital Life by William H. Flaherty, an electrical engineer. He and his wife, Georgia (Clark) Flaherty, lived in Brookline. By 1941, 396 Marlborough was the home of Charles Bouin and his wife, May Regina (Flaherty) McEvoy Bouin. They previously had lived in Newton. May Bouin was William Flaherty’s sister. Charles Bouin was a retired physician employed in research with the Commonwealth of Massachusetts. Charles Bouin died in January of 1951 and William Flaherty died in September of 1951. In his will, William Flaherty left 396 Marlborough to May Bouin, and she and her unmarried daughters, Regina Bouin and Isabel L. Bouin, both teachers, continued to live there until about 1957. On November 15, 1957, the Tremont Investment Company foreclosed on a mortgage it held on 396 Marlborough and took possession of the property. On January 24, 1958, 396 Marlborough was acquired from the Tremont Investment Company by C. Charles Todis. That same month, he filed for (and subsequently received) permission to convert the property from a lodging house into nine apartments. On March 5, 1958, C. Charles Todis transferred the property to himself and John C. Sterge as trustees of the S & T Realty Trust. On February 23, 1978, the JAE Corporation foreclosed on a mortgage it held on 396 Marlborough and sold the property to Peter P. Papesch, trustee of the 396 Marlborough Street Realty Trust. On March 3, 1981, Peter Papesch converted the property into seven condominium units, the 396 Marlborough Street Condominium. In April of 1981, he filed for (and subsequently received) permission to convert the property from nine apartments into seven apartments, conforming the legal occupancy with condominium master deed. On June 19, 1981, he amended his plans to add a penthouse (the number of apartments remained seven).